Hi All: Here's the Blog version of 2 great pieces printed in our 2017 Magazine - in case you missed it. I'll continue to post rules explanations and archival material over the winter. But come Spring, if you like to hear from your pals in the Canadian Albacore fleet, someone else will have to step up as editor of this mag! Will it be you? Please let me know! And, of course, if you want to contribute anything blog-friendly, send it my way. Thank you to Calvin Tsang and Renee Chu for this post's beautiful pics. It has come to my attention that there is some curiosity about why 6841 has risen above its usual FNR ranks. While in the past ten (!) seasons we have shown flashes of brilliance, it’s generally been mere flashes, followed by long stretches of above mediocre results. If you’re reading this hoping for some brilliant insights, you should probably stop now and go find some fun cat videos on youtube. This is because I am scared of numbers and have no technical or tuning tips to offer – I leave that to people like George Carter. Dave might have some good varnishing tips (likely of limited usefulness to Ovington owners). I am, however, happy to debunk or confirm some of the theories that I am guessing are wafting around the fleet like a fart. 1. We colluded with Russia. FALSE. We did not collude with the Russians, and even if we did, it’s actually perfectly normal to do so. 2. We are taking steroids. FALSE. This can’t possibly be true, because steroids only work to “enhance” the outcomes of exercise, and neither helm nor crew exercises, unless you count crushing a bag of chips during a race as exercise. 3. We finally learned how to sail together. TRUE. We have always understood that we communicate differently (i.e., I like explanations for decisions Dave is making, and Dave doesn’t like to explain anything). 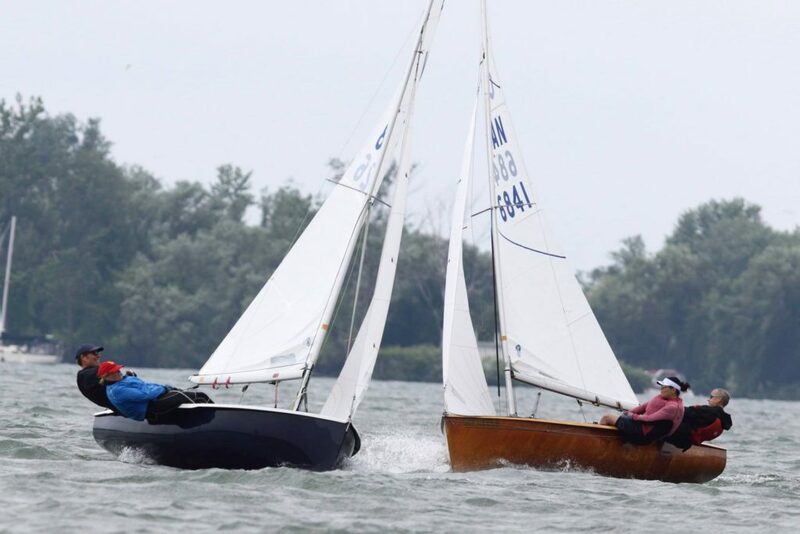 We also have different ways of approaching certain problems (i.e., Dave doesn’t mind sailing in dirt, while I go batsh*t crazy; Dave loves the port tack layline like Trump loves chocolate cake, and I just close my eyes when we get close to the windward mark and brace for impact). But this season, we’ve kind of learned to meet halfway (or more like I have gone 3/4 of the way, and Dave has budged 1/4) and listen to each other (or we’ve gotten better at pretending to listen to the other person), and one of us (me) has learned to tone it down because Dave takes advice better if I’m delivering it calmly. And Dave only goes to the port lay line if he’s feeling really desperate. 4. We have put more time into the boat. FALSE. 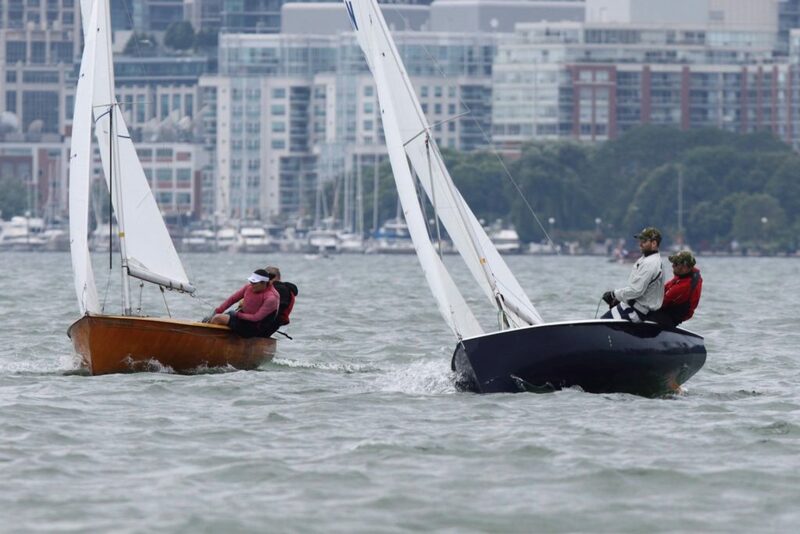 We raced a lot more back when we first teamed up, but in the past few years, Dave’s time has become limited and I’ve been skippering my other boats. But that’s actually been helpful because it has forced me to see the bigger picture, adapt different techniques, appreciate what a helm does (to be clear, not that much), and importantly understand that crews can be a giant pain in the a*s when they are trying to steer from the front of the boat and so I should probably stop nagging him so much and find other ways to deal with his erratic driving (like instead of constantly saying he’s pinching, squeeze the jib in even harder). 5. Stephanie has started hiking. FALSE. But I have gained some speed pudge (and so has Dave although he vehemently denies it). 6. We got new sails. TRUE. After many years of buying Evolution nee Quantum sails, we finally bought a set of Norths (based on George Carter’s advice that they are idiot proof). They’ve been pretty impressive (as was the service from Geoff Moore), as our off wind speed is much better, and they seem to de-power much easier than the Evolutions. TRUE/FALSE. We still fight, but now we’re both too tired to fight as hard as we used to. So to summarize, the keys to achieving success in the albacore in only 10ish years are to buy North sails and race with your best friend. I’ve Been Asked, What’s the Secret Sauce? With over 30 years of toiling and little in the way of winning mugs, something happened this year with finishes much better compared to the past. Why did it happen? ‘What’s the secret sauce?’ as one sailor shouted over the water. Is there a silver bullet? Sorry, there’s no silver bullet but you should have known that. This, then, represents what I think is the answer to the question of why we are doing better this year. I have known, as Hilary Clinton said recently, the humiliation of defeat. My experience in the past has been duplicated almost perfectly over the last five years. A window would open for about two weeks every year when everything would go right with wonderful finishes. Good things would happen such as: there would be no one around on the starting line to get fouled up with; we’d choose the right side of the course (but no-one else would); or, we’d get a miraculous lift to the windward mark. Everything went right. But, just as fast, the window would slam shut. Bang…back to the wilderness. Surprisingly, the window is staying open this year (long may it last). Could it be that fairing the hull last fall made a difference? I’ve done the same work every fall for the past five years. What about the new sails? We got new North Sails at the beginning of the year. While they seem to be more forgiving, we’ve had new sails before from other manufacturers, but they don’t help you go the right way. And the boat work last fall? I put epoxy on the floor to stiffen the hull and made numerous small adjustments. While these enhancements are a step in the right direction, I’d be reluctant to put too much faith in any one of them, although the new Norths are pretty sweet. 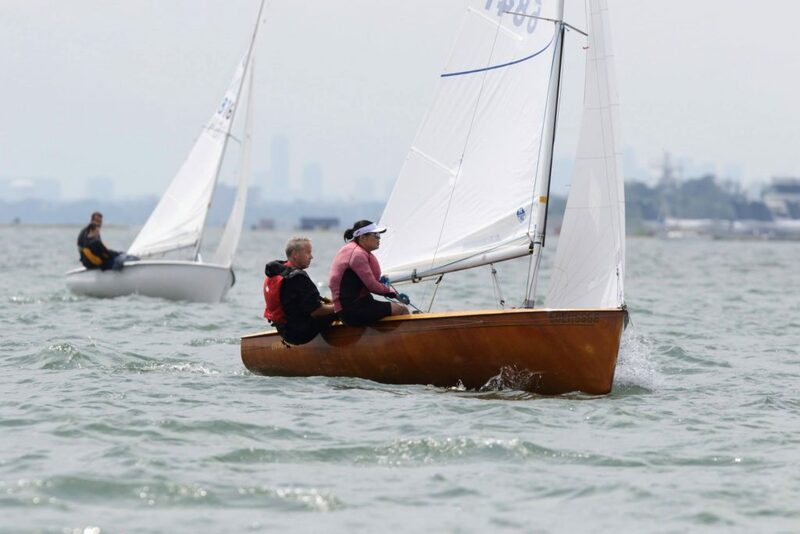 I put a pin in the emotional balloon and said, win, lose or draw, competitive sailing is a recreational sport where the object is a diversion from everything else going on in life. It was about having fun. Yes, it’s more fun to win but the flip side was a slippery slope so it wasn’t about anger either. By design, the crew and I have thrown a lot of the emotional b.s. overboard. One person in the boat hyperventilating about something usually meant that two people were fighting in no time flat. Yes, it’s hell having worked to pass someone only to see them go flying by us on a run. But it happens. Bad tacks, happen. Terrible roll tacks, happen. It was time to get over it. And once the emotions got ratcheted down, not surprisingly, the results got better. While we all like a good finish, the fact is that unless you know why the performance is better, it’s a hollow victory. So we make a conscious effort to pick a side of the course and stick to it. This is a difficult proposition, especially when it seems that the other side is cleaning up. Also, with other boats dictating where you can go with clear wind, the strategy is always under threat. But it’s worth sticking to your guns most of the time because at least it provides a degree of understanding. It is fundamental with so many variables to know what you want to do and have a plan. It demands critical thinking about where the pressure is, how many tacks to the windward mark and holes to avoid. And if you get it right, it reinforces the process and your confidence to figure it out the next time. 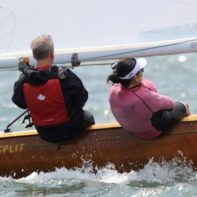 Stephanie Mah and I have sailing together for 11 years. This is no small feat. 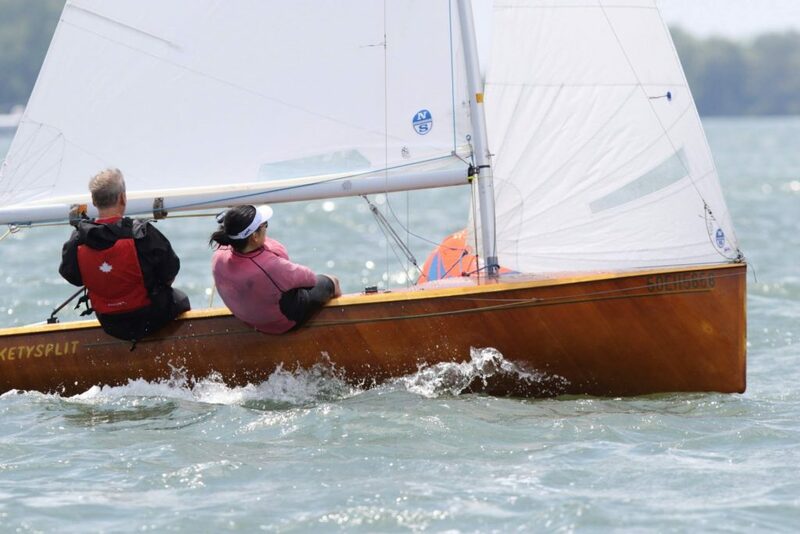 Put any friendship in the pressure cooker of a sailing race where crash tacks happen, where dumping happens, where losses pile up and where petty injustices happen, and it’s a recipe for extreme frustration. Mix in a few well-timed insults and it’s a recipe for divorce. Mix in a bad day at the office and it’s a recipe that could go nuclear. But, when you don’t have to think about the jib setting, it’s liberating. When you don’t have to say more vang or less vang, it drives speed. When you can discuss strategy, two heads are usually better than one. More than anything, the Albacore a team effort. When there is a division of duties, with each person concentrating on their tasks, it is definitely a faster boat. When the tendency is to go hard right and the crew says, ‘Go left you tool!’, and you pick up a couple of boats, that’s a good thing. No person can do it alone. And a good crew makes it a whole lot easier.